Omar linked to a tweet by left-wing journalist Glenn Greenwald, who was criticizing House Minority Leader Kevin McCarthy (R., Calif.) for threatening punishment against Omar and fellow anti-Israel Rep. Rashida Tlaib (D., Mich.). She wrote, "It's all about the Benjamins baby" with musical notes, a reference to $100 bills with Benjamin Franklin's face on them. Forward opinion editor Batya Ungar-Sargon criticized Omar for tweeting an "anti-Semitic trope" and said she'd love to know who is "paying American politicians to be pro-Israel." Omar responded, "AIPAC! ", the name of the pro-Israel lobbying organization. 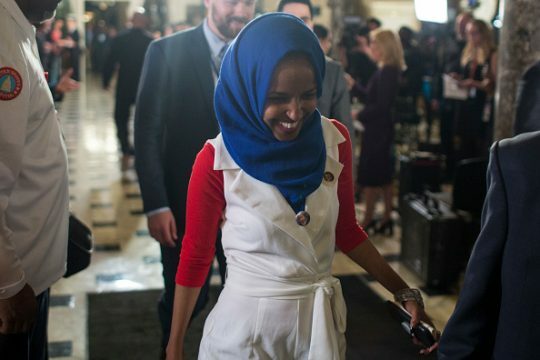 Omar's tweets were met with sharp criticism even from members of her own party, including Rep. Max Rose (D., N.Y.). Rose, who is Jewish, tweeted out a statement calling her words "hateful and offensive." "We should expect all elected officials, regardless of party, and all public figures to not traffic in anti-Semitism," Clinton wrote. Omar wound up tweeting at Clinton that she would be happy to talk about building an "inclusive movement for justice" and added "we must call out smears from the GOP and their allies." More of her Democratic colleagues sounded off on Monday morning, including Democratic Reps. Sean Patrick Maloney (N.Y.), Tom Suozzi (N.Y.), Josh Gottheimer (N.J.) and Donna Shalala (Fla.). Former Obama administration Ambassador to Israel Daniel Shapiro called on Omar to be condemned by all Democrats in a series of tweets on Monday. Rep. Omar’s tweet yesterday went too far. To suggest that pro-Israel support "Is all about the Benjamins," and her follow up that she is referring to AIPAC, is not only inaccurate but conjures up the worst anti-Semitic stereotypes. AIPAC responded to the controversy as well, tweeting, "We are proud that we are engaged in the democratic process to strengthen the US-Israel relationship. Our bipartisan efforts are reflective of American values and interests. We will not be deterred in any way by ill-informed and illegitimate attacks on this important work." The American Jewish Committee called on her to apologize and wrote, "Suggesting that a Jewish organization is buying off American politicians is both demonstrably false and stunningly anti-Semitic." On Sunday night, she retweeted progressives who were supportive of her remarks, such as HuffPost‘s Ashley Feinberg. She also briefly retweeted a Jewish progressive criticizing her remarks who wrote, "she might as well call us hook-nosed." She undid it shortly after.
.@IlhanMN just retweeted this tweet. UPDATE: Monday, 9:50 A.M.: This article was updated with additional Democrats criticizing Omar for her tweets. This entry was posted in Politics and tagged AIPAC, Anti-Semitism, BDS, Ilhan Omar, Israel. Bookmark the permalink.